Poush Sankranti or Bengal’s very own harvest festival is a very traditional one. Focusing on the season’s bounty, the freshly harvested paddy, coconut and notun gur (date palm jaggery) the food loving Bengalis prepare finger-licking delicacies called Pithe Puli. But before that a neivedya (food offering to God) is prepared with atop chal (unboiled rice), banana, gur (jaggery), coconut and milk as an offering to the Godess Lakshmi for blessing us with good harvest. To know more about Bengali tradition and rituals around Sankranti go HERE. I have grown up seeing all these customs being followed in our ancestral house and with time I have become very fond of this festival. Eversince I can remember the most awaited winter season neared the evitable ending with this sweet comfort and we truly loved it. Dida (grendmother). Maa, Masimoni (maternal aunt), mami (aunt) all ladies of the house gathered in the big old kitchen, nestled in the warmth of the stoves on the coldest days spent hours preparing varieties of pithe for us. Those days are now kept safely in my memory and now Maa makes pithe during Poush mela when friends and family gather in our house in Santiniketan. And on sankranti she makes very few pieces just to keep the tradition alive. After my marriage I have started making them and every year try to make something new to learn and renew this old custom. This reminds me of the funny conversation that I had with my mischievous brother yeaterday. Maa this year had learnt and made one new pithe called Pathor kata pithe (literally means sweets that can cut rocks, funny eh!!!). the pithe tastes great and is made by cooking all the ingredients together and then cooling the sweets on a stone plate before cutting and hence the name. But my brother picked the literal meaning and told me yesterday that Maa has made rock solid sweets to throw and pick mangoes from trees. We had a great time laughing on this. Now back to the recipe of today. Gokul pithe is a fried and syrup soaked dessert traditionally made with flour and coconut. These are widely available in almost all sweet shops in Bengal during this season, but somehow I never liked the taste. Sometimes they are not properly cooked or the frying oil makes for a bad odour in the finished product. It is never made at our house so none has a recipe. I wanted to make this for hubby who has mild lactose intolerance and avoid milk-based products. Last year I made Ranga alu’r puli or Shahi Gulab Bagh for him and this year its Gokul Pithe for him and I finally decided to go with my own recipe. I have vague idea that traditionally it is made only with coconut stuffing but I added some homemade cottage cheese to it and finally soaked the deep fried balls in notun gurer rosh (date palm Jaggery syrup). The end result is a divine taste that everyone simply went ga ga on. The ambrosial taste of these syrup soaked balls with a delicately flavoured soft inside is sensational. We enjoyed it immensely and will not wait for another Sankranti to make this delicious dessert again. Start by soaking the semolina, as this will take 30 minutes to soften. For this take the semolina in a big bowl and pour warm milk on top. Don’t add all the milk as the quantity of milk required on the type of semolina. Add half of the milk mix and see if it soaks all the milk. Add little at a time to get a thick mixture. Cover and set aside for 30 minute. In a non-stick pan or kadhai mix the sugar and coconut. Cook it by stirring on low flame till the sugar dissolves and the coconut becomes dry. To this add the drained cottage cheese and cook till the mixture leaves the side of the pan. Add the jaggery and milk solids and cook for another couple of minutes till the mixture is dry. Pour in a bowl and let it cool down. In the mean time in another heavy bottom pan take all the ingredients for syrup and boil to get thick syrup (approx. 5-8 minutes).keep it warm. Mix in all other ingredients to the semolina mixture and fold gently to get a smooth homogenous mixture. If needed add more water or milk. The consistency should be very thick but pourable. Heat the oil in a kadhai or thick bottom pan for deep frying. In the meantime make small balls from the coconut mixture (I got 20 pieces to end up with a Ping-Pong ball sized Final product). Dip these balls one by one in the batter to uniformly cote them and carefully place them in the hot oil. Fry on very low heat till they are golden brown in colour. Drain the oil and immediately drop them in the warm syrup. Let it stand there for an hour to soften and soak up the delicate flavour. Here is a glimpse of my Pithe spread this year. Anti clockwise, Nolen Gurer Rasogolla (recipe coming soon), Dudh Puli with jaggery and coconut stuffings, Gokul Pithe, nolen gurer Sandesh (recipe coming next) and nolen Gurer Patisapta. Yes, we truly are having a grand Pithe Parbon (Pithe festival) with mouth-watering date- palm jaggery flavoured delicacies. It’s a lot of work indeed but at the end of the day am proud to be one of them who try to keep traditions alive and pass it on to the next generation. You can find more Pithe recipes at the top left bar of my home page. Replace jaggery with sugar if needed. You can omit milk solids and cottage cheese if required. It will still taste good. I was just thinking that the store bought gulab jamun mix should work as a replacement of this semolina-flour batter. But while mixing the batter should be very thick to create a chunky cover for the stuffings. pithe, pitha, puli pitha, chitoi pitha, gokul pitha, bhaja pitha, bhapa pithe, Bangladeshi pitha, bangali pithe puli, dudh pithe, pur pithe, pati sapta, soru chakli, sorychakuli, mugsamali, muger ali, poush parbon, pithe parbon, poush sankranti special, bengali sankranti treats, bengali sankranti special mishti, naru, mishti, monda methai, mithai, payes, notun gur, khejur rosh, khejur ras, nalen gur, nolen gur, payasam, rice flour crepes, bengali rice floue crepes, how to make pithe, pithe preparation, pithe recipe, pithe step by step with picture, pithe pictorial, best pithe recipe, authentic bengali sweets, authentic bengali dessert, authentic bengali pithe, sweet coconut stuffed rice dumplings, bengali rice dumplings, Indian rice flour crepe and dumplings, sweet snacks, sweet rice dumplings.date palm jaggery, palm jaggery, date palm sap. I almost got jealous you have such nice cool pots..lol..What a wonderful festive spread, you totally brought back childhood memories of Sankranti.. Happy Sankranti to you n your family dear..
wonderful post and the sweet spread pic is just awesome....I am definitely going to try this one..."Happy Sankranti" to U and your family. Happy Sankranti,all the dishes look delicious. Happy sankranti wishes to u and ur family.. Such a delicious spread of yummy festive foods, soo tempting. Happy Sankranti you did awesome job. spread looks delicious. love it. waiting for the rest of recipes. Look like gulab jamun but not, everything is awesome. Hope you had a wonderful Sankranti! u are tempting me with these many sweet treats.. yummy! Sankranti wishes to you and your family! Festive greetings to u & family !! the spread looks yum-loved the recipe; it is bookmarked ! Wow--can't wait for the sandesh recipe--I love sandesh. What a wonderful spread! Sayantani enjoy the Sankrant. Book marked. Gokul Pithe looks so tasty. 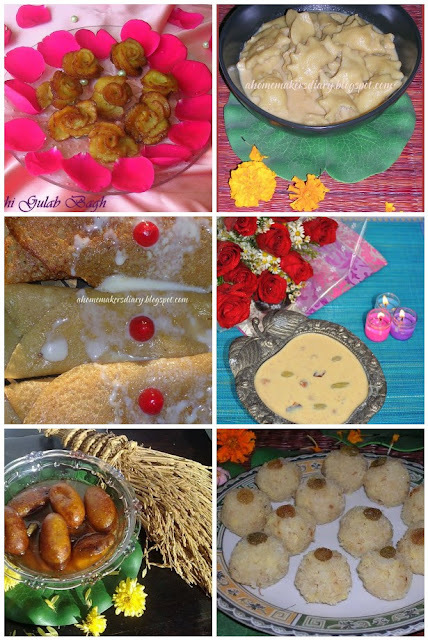 Happy Sankranti..All the sweets look amazingly delicious, Sayantani..Great post!! Lovely pics too.. Happy Sankranti and very tempting post Sayantani. All the sweets are mouth watering, I am sure you are very pleased with yourself. Gokul pithe looks yummy , i have had a oriya version of this pithe but do not know the name . nice post..and all the pictures are so mouth watering...just want to grab them from the screen..
excellent post Sayantani. How are you doing lately? Thanks everyone again for your wonderful words. @Rekha, the batter would be very thick like the idli batter, thick and pourable. have replied on your page. happy sankranti ..wow thats call celebration...most of the dish r new to me ..thx u! Beautiful post! U have stimulated my sweet tooth again, no way of shedding the bulge at the cost of your Gokul Pithe. Will try soon. this is a lovely post! I enjoyed learning about a new festival and new sweets! these gokul pithe look very delicious! This is why i love blogging ! I havn't even heard of this recipe, and now i want to make it as soon as i can. Thank you very much for this very informative post, there are many dessert recipes in your blog, that i feel i should absolutely make. Thank you, thank you, i am a big fan of Bengali desserts, they all have very poetic names too. Happy Sankranthi ! Hi Sayantani, happy sankranti . Looks like you have sumptuous feast for sankranti. S, you are the goddess of such traditional customs. Take a bow girl. Love the pictures and the flavors of tradition in this post. Happy Sankranti and your post reminds me of all wonderful memories of the traditional things I had in my home.. I wanted to do a post on Sankranti but dropped the idea after seeing your post, you have done such good job, I do not think I can add anything more to this. @Miri, sorry I have become so forgetful these days. have updated the post. Wowie Dish . Keep Posting. Dishes look great..awesome photography too..